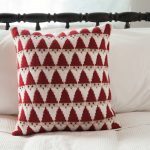 This Iron Craft challenge was to use one of my favorite supplies, felt. I wasn’t sure what I was going to make and then I kept seeing these little elves in all the stores around Iceland. I was tempted to buy one, but they looked so much like something I could make and the perfect project for this challenge. 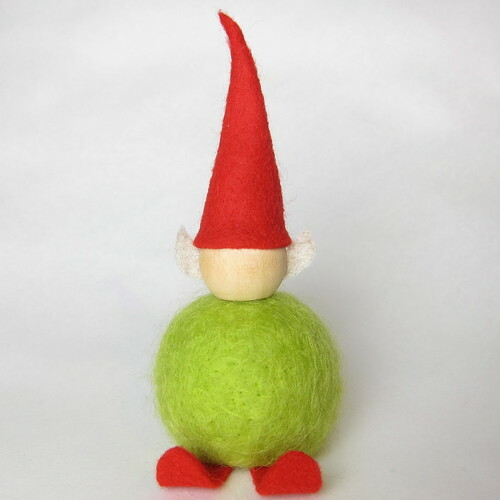 Not only does this project use felt, but I created my own by needle felting. I think I’ve got it down pretty good. I didn’t do the embroidery though. The ones I saw in the store were thick felt and hallow inside. 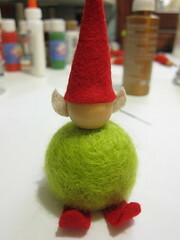 I used a styrofoam ball covered in wool for the body of mine so embroidery would have been tricky. 1. 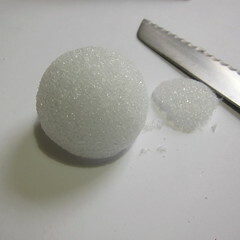 Using the serrated knife, cut a small part of the bottom off the styrofoam ball to create a flat base for it to sit on. 2. 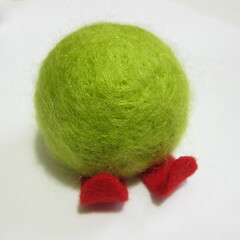 Needle felt the wool around the ball – You can use either roving or lightly spun 100% wool yarn for this step. 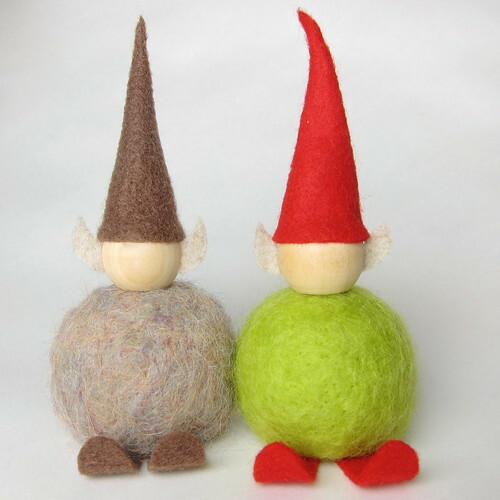 The yarn must be wool to felt. 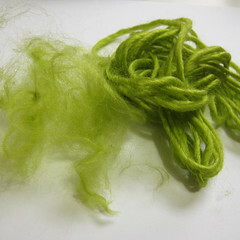 I used Sheep(ish) is Chartreuse(ish) which almost isn’t spun at all. 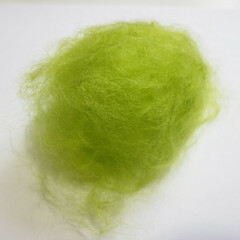 I like it’s bright color compared to the green roving I had on hand. 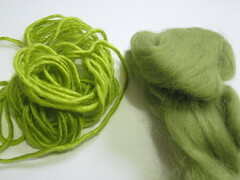 Whichever you use, pull it apart to create a cloud of wool. 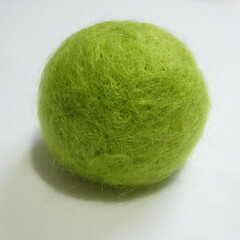 Cover the styrofoam ball with the wool and use the needle felting needle to felt it to the ball. I didn’t bother covering the bottom. You are trying to get a relatively smooth felt surface, though it’ll never be completely smooth. 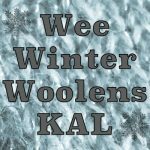 Add more layers of wool if you have spaces that you can see through. 3. 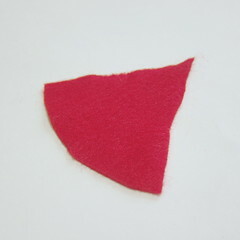 Make the hat – Cut a quarter circle from the red felt. 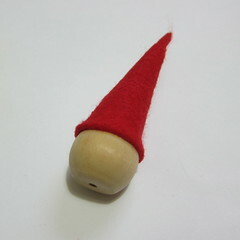 The curved part needs to be wide enough to go around the wooden bead with a little overlap. 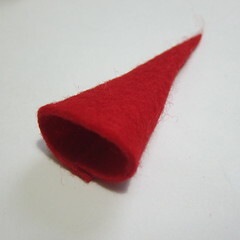 Fold into a cone and glue together with fabric glue. I twisted the top of the hat a little to give it even more of a point. 4. 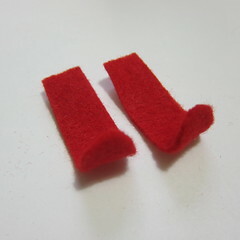 Make the ears – Cut two pointed ears from the tan felt. 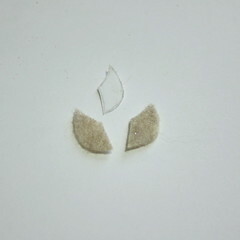 I made myself a little paper pattern which made it easier to cut two pretty identical ears. 5. 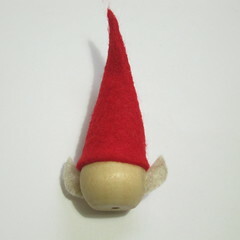 Glue the hat and ears on the wooden bead. I just used a little tacky glue for this. 6. 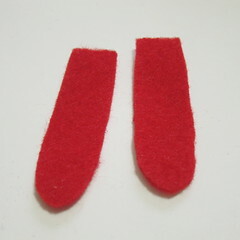 Make the feet – Cut two rectangles of the red felt that cover the bottom of the ball and stick out about 3/4″. Round off one end. Roll the rounded end up. 7. 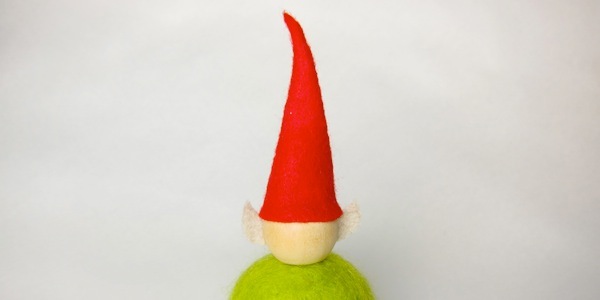 Assemble the elf – Glue the feet to the bottom of the ball. Then the wooden ball to the top. Let dry. I love these. They are super cute! Nicely done. 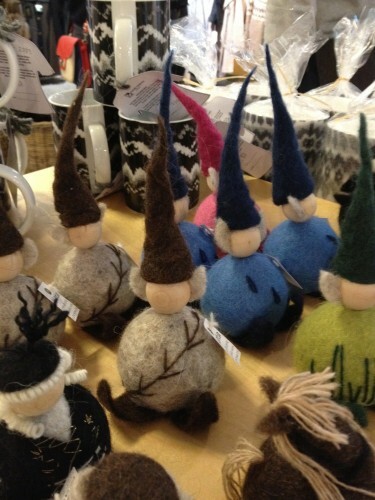 I can’t wait to try these… they would be so cute as ornaments or on the mantle. Thanks for the idea!! These little fellows are so cool! Thanks so much for the awesome tutorial!